We have great discussions with this group, and the night we watched that video was no exception. Because we were running a little late, so we started with one topic that we thought would be meaningful but quick. It turned out to be awesome, and I am glad that I decided to start writing down the suggestions. I’d like to share them with you. The topic: What are some practical tips that help you get the most out of Mass? We talked first about we don’t go to Mass to “get,” we go to worship. However, effort on our part to enter fully into the liturgy can be life changing. Think about how much preparation you put into daily actions. Getting ready for a job interview...Hosting a party in your home...Making decisions about a fantasy football league...Packing for a vacation...Now imagine the King of the Universe was coming to your local church for a visit later this week. Would you prepare? Yes! But, we don't have to imagine...the King of Heaven and Earth is at every Mass. Put effort into your preparation accordingly. Get some kind of publication that has the Mass readings, prayers, and reflections in it. Magnificat, Living with Christ, and Word Among Us were a few that were mentioned. Use it to read the Mass readings ahead of time, or to read them on weekdays when you can’t get to Daily Mass. The reflections also come in handy during a boring homily. Just kidding. If you don’t want to spend the money to subscribe to one of those, you could always ask your pastor if the church has any extra missalettes. It is not recommended to just steal one out of the pews, however. Another way to not have to spend the money on something like the Magnificat is to use online resources. The USCCB has all of the readings, etc. on its website. There are also Apps for smart phones so you can always have the resources at your fingertips. There is a beautiful rhythm to the Liturgy, not only in the Liturgical Year, but within each Mass. Follow along in the resources provided by the church or in some kind of publication like in #2. Bring your Bible and read the readings straight from it so you can understand more of the context and see the continuation of the story from Mass to Mass. Spend time becoming more familiar with the Mass; where the prayers come from, the symbolism behind everything, the Biblical origins of the words and actions. You can't love something unless you know it. Know the Mass=Love the Mass. When all else fails, show up. Simply being in the presence of the Lord (instead of at home with the covers over your head) is an act of worship on your part. Be there. Our relationship with Christ is never about us finding Him, but Him pursuing us. So sit back, and let Him woo you. Mother Theresa advised priests to celebrate each Mass as if it was their first Mass and their last Mass. The laity can look at it the same way- Receive the Eucharist each Mass with the enthusiasm of our first time and the devotion of our last time. 8. Why were you ever out? Coaches use lots of motivational sayings to inspire their sports teams. One that makes a great analogy to Mass is that winning a game is an all time thing, not a one time thing. Worship is an all time thing, not a one time thing. 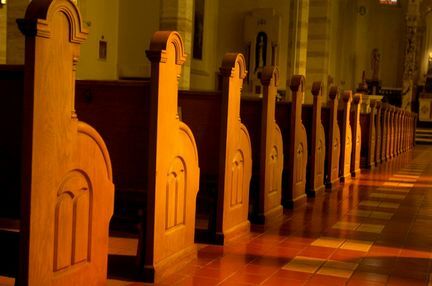 If you shut off worship when you leave the church at 8:59 a.m. on Sunday, and don't turn it back on until 7:58 a.m. the following week, there is a problem. Worship should be like breathing- you should never be "out." 9. Why are you bored? Bored is an overused term in our society. Why are you bored? If you have done steps #1-8, you will not be bored. We don't remember Acts 2:42 saying "They devoted themselves to the Apostles' teaching and to fellowship, to the breaking of the bread and prayers AND the amazing technicolored light show and phenomenal music set." Nor do we remember in Luke 24 Jesus revealing himself to the disciples on the road to Emmaus through opening the Scriptures, breaking the Bread, and performing an awesome liturgical dance. Our expectations of "entertainment" need to change. We are not there to receive, but to give. Don’t go sneaking out after Communion. You have five more minutes. Remember, Judas left early too. Sunday is not the end of the week. It is the first day of the week, and it deserves to be seen as such. Instead spending a chunk of Sunday dreading Monday, start looking at Sunday as the point from which every other day flows, your source of strength for the week. This should be the overarching theme. Do you have any other suggestions to share about entering more fully into the Mass or your worship services?